Long Pond, PA - RIS - Alexander Rossi makes at statement at Pocono Raceway, “It’s Not Over, Till It’s Over!” With four races yet to run Rossi takes his #27 NAPA Auto Parts Honda and wins the ABC Supply 500 at Pocono Raceway. The Pole Sitter Will Power lost the lead on the very first lap, but took it back about lap 110, but it didn’t take long for Rossi to make his statement and finish ahead of Power with about 4 seconds to spare. After the long layover after the devastating crash involving Robert Wickens in his #6 Schmidt Peterson Motorsports Honda. Wickens took out the catch fence in turn two and about four other rides. That layover was approximately two hours long and the race re-started with 15 competitors left, who all finished. 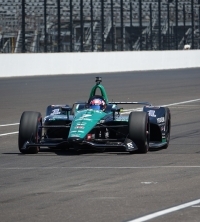 Alexander Rossi trailing Points leader Scott Dixon finished two spots ahead of Dixon so the 46 point lead has dwindled a few, and with three events to go look for more heat, action, and expectations of Series Championship. Dixon may not be sweating it as the average lead with four to go has been 37 points since 2008, so he most likely feels he can surely maintain this lead to win his fourth Series Championship since 2008, He just needs to remember that two of those years he over came that 37 point lead to win two of those championships. Will Power took the Pole with a Blistering speed of 219.9 MPH in time trials, but could only pull out a second place finish with the event. Will Power is seated in the Verizon Team Penske Chevrolet #12. Third place finisher is Scott Dixon wheeling the #9 Chip Ganassi Racing Honda. 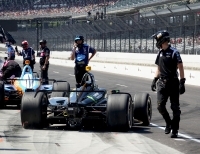 Fourth place went to #18 Sebastien Bourdais the chauffeur of the Dale Coyne Racing Honda, and Fifth was Josef Newgarden sitting in the #1 Team Penske Chevrolet. and to round out the top Six Finishers would be Zack Veach in the #26 Andretti Autosport Honda. Remember all places are subject to inspection so this has not been deemed official by Verizon IndyCar Series Officials. Just to let you know Robert Wickens was conscious, and responsive, but was still taken to a Hospital in Allentown for further examination. It was one wild ride for the Rookie, but the cars safety features as well as the safety features at Pocono Raceway greatly lessoned the force of the impact. It looked scary, it was extremely fast, and yes it looked bad, and still they walked away, Thank God for that!